Last time (a long time ago!) we had worked out a way to write many cards cleanly and efficiently, whilst maintaining a consistent style. By now you’ll be keen to print out your cards for quick prototyping, or make the step towards printing cards at a publisher like The Game Crafter. We’ll look at a way to turn each LaTeX card into a PDF of the right shape and format for printing, as well as making card sheets for our own prototyping. % To make sure we don't have page numbers. This ends up with a PDF with two cards per page and a lot of wasted space. Our two methods in this post fix this by either cutting the page down to exactly one card per page (and have the page the right size), or squish more cards onto a page. Throughout this series we’ve assumed poker-sized cards (2.5” x 3.5”). If you’re looking at different-sized cards, just change the \cardwidth and \cardheight in the preamble to the correct dimensions. 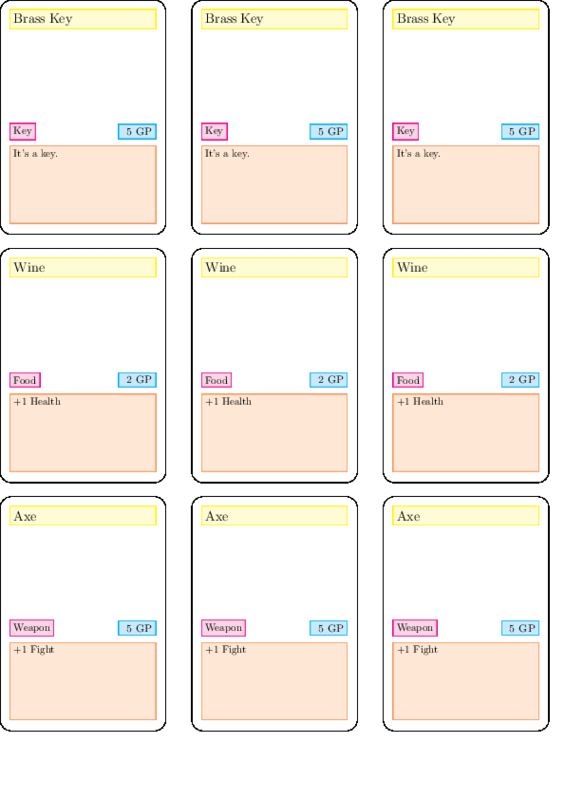 Card sheets are a way of arranging cards into an array on your page. This lets you view more cards at once in case you want to get a sense of the cards’ graphic design across the deck. If you’re prototyping your own cards, it also gives you a way to easily guillotine a standard page into cards with reduced wastage. If we surround our card declarations with the proper environment, we’ll get arrays of 3 cards per row. This means the line is too short for 3 cards to sit comfortably. But you’ll notice there’s a gigantic, uneven margin which we don’t need. I’ve reduced the margins to 0.5 inches on all sides. This lets three 2.5” x 3.5” poker cards sit per row on an A4 sheet of paper. If you use different-sized paper, then you may need to fiddle with the numbers. You can also save a little bit of time and set the margins to 0 so you don’t need to guillotine all the edges off. If you have too many cards for one page, it’ll nicely just continue on the next page. 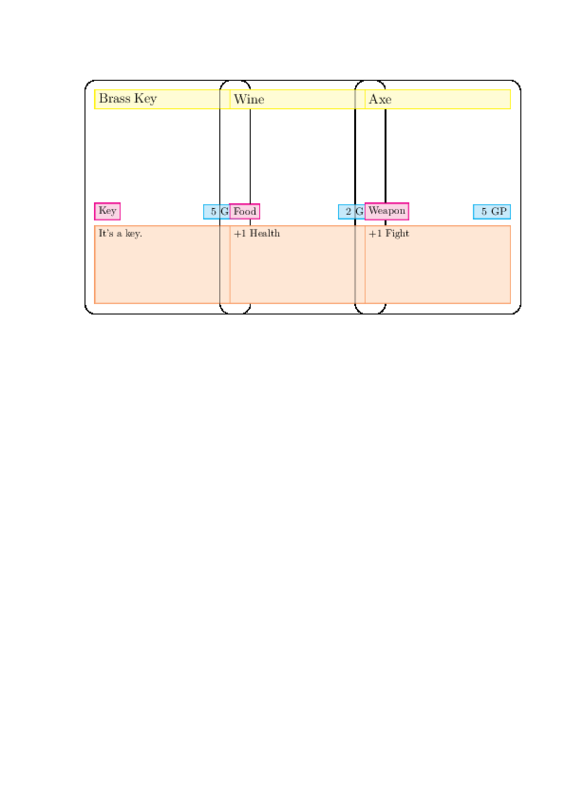 Unfortunately to get an ultra-tight layout, you need to arrange things yourself with tikz. As they are, cards are big boxes followed by a space. If you remove the space, they stick together and overfill boxes. I found that the effort in wrestling with LaTeX was more than the time required to guillotine a little bit more. If you are using something like The Game Crafter, you need to supply your cards as individual PNGs. They offer a variety of templates if you are doing manual graphic design. Since we’re automating our process, we need to be able to output PNG files of the right size. The PDF output will be one card per page, and if you look at document properties, the pages will be of the right size (2.5”x3.5”). You don’t even need to unset all your multi-columns or page margins. 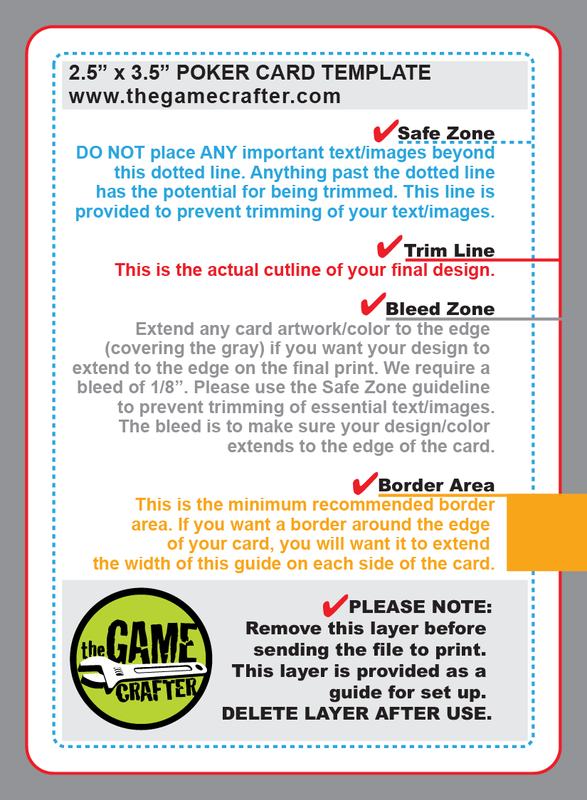 the bleed zone, which is area to be trimmed but still printed on. This is so your colour goes all the way to the edge. Our cards currently draw the trim line. We need to expand the template to include the 1/8” bleed zone. This automatically adds a 1/8” border around your image by hijacking how the PreviewEnvironment looks. Unfortunately if we want to have our design bleed all the way to the edge - say if you had a colour or image background - then we need to monkey with the template. This is because the earlier design uses a mix of absolute placement. This version tries to align to the card corners, whilst maintaining the bleed area. Interpret the next file as being 300 DPI instead of the default 72 DPI. This is the recommended resolution by GameCrafter. 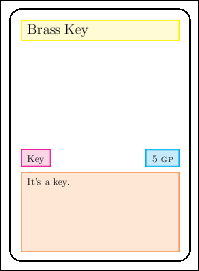 We’ve put together a rough template for a card game prototype. After you’re playtested your game, you’ll want to design the cards properly. This can all still be done in LaTeX, following the steps above. It’ll be different, of course, based on your design. You’ll tend to want to have the actual card area be borderless, due to drifts in printing. Either have a large image or a flat colour that extends beyond the borders. You can use fancy fonts for your text. See here for a general tutorial, and here for a catalogue of interest LaTeX fonts. If you want to make sure your colours come out accurately, you need to worry about colour spaces. This is a complicated affair, but you can get some ways there with letting xcolor know. 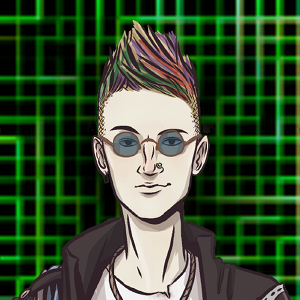 Typically you want to design in CMYK and then convert to RGB for Game Crafter. where the original PDF is in CMYK mode and the above line converts it to the Adobe RGB mode. It’s been a long while between posts, but hopefully this has been useful. If you have any questions, comments or suggestions, let me know in the comments below or via email. If you make a game with this approach, I’d love to see it!